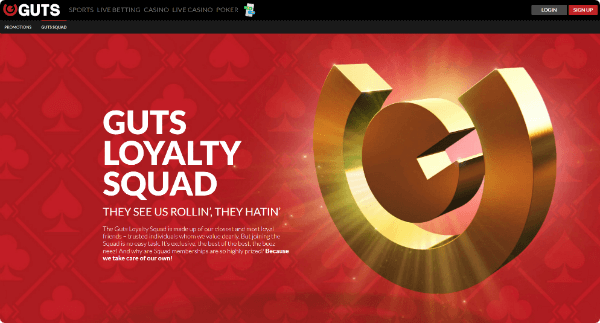 Guts is a rather new online casino that will impress you with your first acquaintance. After all, the ex-manager of the casino Nordicbet Ben Klemes replies for its launch and excellent work. Ben is always active and ready to help in various forums about casinos and often helps to solve emerging problems. And here is his new project, Guts was created and launched by highly qualified iGaming professionals who are able to provide quality online gambling experience. Guts Casino operates under a license issued by the Malta Gaming Authority. By the way, it should be said that this casino is the best by the version of Casinomeister portal, which is the largest and most respected portal. So, further we would like to conduct a brief overview of this gambling establishment, relying on the main aspects of its activities. The welcome bonus package consists of four bonus offers. On the first deposit, players receive a 100% bonus up to C$ 100 and twenty-five free spins of the Starburst slot. Simply enter the bonus code GUTSB1. Free spins can not be won back. For the second replenishment the player gets 50% of the deposit, as maximum - C$ 50 and 25 free spins points of the same slot machine. Bonus code is GUTSB2. The limit of the third bonus is also C$ 50, but this time the bonus percentage is 25% and the same free spins package, enter the code GUTSB3. The code for the fourth bonus is GUTSB4, it is 200% bonus to the deposit to C$ 100 and 25 free spins. Free spins are credited to your account immediately after entering the bonus code. Bonus funds are accounted separately from the player's money. They will be used only after the real money in the account runs out. When you try to withdraw money from your account with an active bonus, the bonus and winnings will be eliminated. It should be said that this casino, like many others, prohibits certain countries to place the bets in their institution. This list includes: USA, France, Denmark, Belgium, Spain, Italy, Turkey, Hong Kong, Afghanistan, Ethiopia, Iran, Iraq, Jordan, Kuwait, Pakistan, South Africa, Syria, Singapore, Nigeria and Yemen. But this list is not final. It can be replenished by the discretion of the administration of this gambling establishment. There is also a separate list of countries that, unfortunately, can not receive the welcome bonuses at the Guts Casino: Poland, Bulgaria, Greece, France, Hungary, Romania, Croatia, Ukraine, India, Pakistan, Indonesia, Russian Federation, Czech Republic, Portugal, Slovakia, Latvia and Thailand. Guts Casino offers games from several developers: Microgaming, NetEnt, IGT, Betsoft, Leander Gaming. Slot machines are divided into several categories: video slots, classic slots, 3D slots. There are blackjack, roulette, board games, video poker and games with a progressive jackpot. There are also real dealers in about 40 games. These are several types of baccarat, roulette, blackjack and poker. 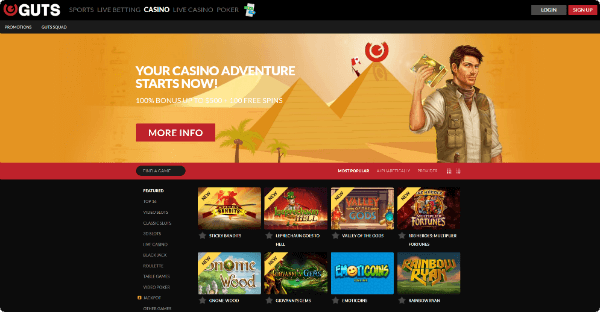 When you enter the section, you will immediately see the full selection, including games, dealers are online and offline. One of the main advantages of Guts is that it does not need to be downloaded.  All games are designed in such a way that they can be played through the browser, which means that you don’t need to spend long minutes installing the software. If you have Flash or Java (of course you have, because these plug-ins for the daily work of such sites as, for example, YouTube) - you are ready to play. For users of the operating system, IOS, Android, Windows phone, and Linux, everything also is fine. All you need in order to stay on the wave of excitement anywhere in the world is the browser (Safari, Chrome, Firefox) and a good Internet connection. Next, you just need to go to the casino site. 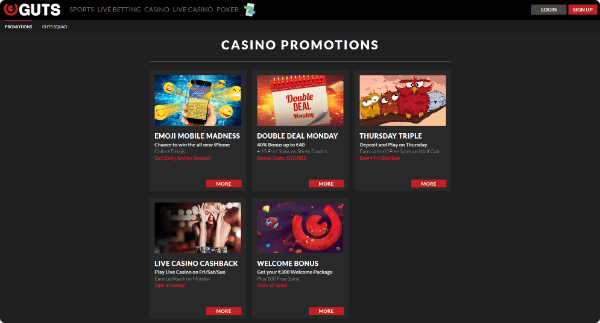 The mobile version not only makes it possible to play in a traditional online casino, but also offers games with real dealers, as well as sports betting. Fast, friendly and highly qualified support staff know exactly how to help you and are available 24 hours a day, seven days a week, live chat, email or phone. Do not hesitate, if you have a need to ask a question, the experience of casino employees will not allow you to remain unanswered on the question. The casino focuses on quick payouts without problems. Purpose - output of money during two hours after the request. Also a highly qualified 24/7 support service is available, available round-the-clock. Another advantage of Guts Casino is its wide choice of input and output methods. Guts Casino supports the following payment systems: Visa, Mastercard, Ukash, WebMoney, Neteller - output instantly, Skrill - output instantly, Paysafecard. Guts casino I great for their Live Casino room as well as their Sportsbook. I don’t play too much at the regular casino but do a lot of football betting on the Premier League and their odds are fantastic. Being able to switch between sports betting, casino play and Poker is ideal for me as I like to be flexible with my betting. Guts lets me do that with my account, plus I get really good bonus offers. I’d recommend the site to anyone looking for a new online casino to play at. A casino, sportsbook and poker room all rolled into one? Guts is basically my dream site! I’ve enjoyed playing here for the last 3 weeks and I think I’ll definitely play more often. I like trying different types of betting so guts is perfect for me because it has an online casino, Sportsbook AND Poker. It’s a great blend of betting action and I enjoy the site hugely. The sportsbook at guts is the main reason I have an account, they have a brilliant selection of markets and I mainly bet on Premier League Football and Hockey. With good bonuses and decent odds it’s a top place to bet.